Gnomefoam is the alter ego of the English artist Steve Bromley, referred to by his label endearingly as an incompetent fool. While this bears evidently a strong mark of irony, you still shouldn’t expect regular music, because Gnomefoam is not what we commonly call a musician. Instead he is collecting all kinds of samples that he found on the Internet, and with help of the software Audacity, he is merging them into quite strange soundscapes, that while retaining a resemblance of music, never seem able to hold a line. 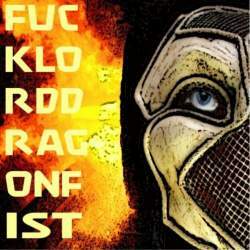 There are ten tracks featured on Fucklord Dragonfist, but sometimes it’s hard, even impossible, to discern if a new song starts, or if there is just another, totally different part happening within the same piece. You can’t accuse Gnomefoam of lacking eclecticism. He’s integrating every possible genre into his sonic architecture, from trip hop beats to death metal guitar riffs, from industrial beat hypnotism to a cappella voice parts. This is all very interesting but you need to invest time and attention to get the most out of it. Although Gnomefoam has been releasing CDs only since 2008, Fucklord Dragonfist is already his eighth output, proving that this is a very fertile and creative project. Even those who doubt if they really need this album, every friend of samples based music should still check out his music, as it is available free of charge on the net label Rack and Ruin Records.